A week ago I had the privilege of preaching on Whole Life Worship at Newborn Church (Pastor Felim Valentinus), the young adult congregation of the Indonesian Christian Church in Rowland Heights, CA. They are a delightful group of 15-30 year olds who want to change the world for Christ. It was a very refreshing experience for me. One of the things I taught was the illusion of trying to give God “everything.” Usually, when we vow to give God everything, we end up giving Him nothing. We can say to God, “Here’s my whole life,” and in the next moment do whatever stupid thing we want to do. It’s easy to put superlatives on our intentions, but actions can only be accomplished one specific thing at a time. We can’t give God everything; we can only give Him the next thing. Think of our lives as being a million dollars. When we give God “everything in our life” at one time it’s like giving God a million dollar check. But every time we decide to live life our way, it’s like erasing our signature on that check. It’s like giving him nothing but a piece of paper. So the Lord tells us to convert the million dollars into quarters. Each of our life’s moments is like a 25 cent situation. We can choose in that moment whether we keep the quarter or to give it to Jesus. The object of a life devoted to God (what I call Whole Life Worship) is to eventually give him each of the 4 million quarters, one quarter at a time. That is what it means to give God everything on His terms. Isn’t that a great analogy? I wish I knew about it before I preached to the good folks at Newborn (maybe some of you are reading this blog now). In any case, when you think about worshiping God in your everyday ordinary, think about giving Him your life one quarter at a time – each decision, each encounter, each frustrating moment, each victory, each mundane task, each wisp of encouragement, each insight, each leg of a commute. You get the idea. And the amazing thing is that for every “quarter” we give Jesus, He multiplies it – like the fish and the loaves. Each 25 cents of our lives that we place in the hands of Jesus unlocks Kingdom of God potential; leading to relationships, resources, opportunities, transformation of self and situations, thoughts and ideas that never would have existed if we kept it to ourselves. So what are you going to do with your roll of quarters today? Let’s see if we can give them all to Jesus, one quarter at a time. 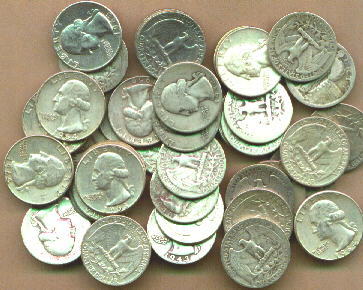 My new idea of “rich” is to have an empty roll of quarters at the end of the day. That’s Whole Life Worship wealth!